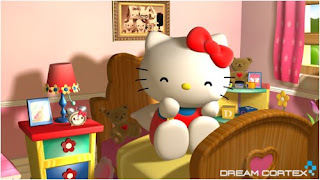 Have you been out doing some great Hello Kitty 2010 shopping yet? I haven't yet gone back to doing some major damage to my wallet for some Sanrio stuff. Since getting sick, I haven't ventured out of my little apartment so I really need to do that soon. Finally, my nagging cough is gone! Yesterday, I was coughing like I had a fur ball stuck in my throat! I'm glad that Robitussin meds started to finally work because it failed me all weekend. I felt like I was dying that I wanted to drink the whole bottle to get rid of this bad cough, but my sane brother took it away and took over my per 4 hr. dosages. Thankfully, most of my feverish dreams were something I can't really remember, but I hope Hello Kitty, Pochacco, or even Keroppi popped in somewhere. I've had one or two weird Sanrio related dreams before I had gotten sick. In my dream, I was suddenly in this room with all these vintage Hello Kitty/Sanrio stuff that just appeared out of nowhere. I was like, "For me?" I was literally jumping with excitement, especially over the fact that I had doubles of nearly everything. How lucky could I be? Should have been the first sign in my dream that it wasn't real, but it felt so good because the stuff was brand new. The dream was cut short when I woke up in the morning. Let me tell you I was so disappointed that the dream wasn't real at all. It felt like they just had been in my hands and now they're gone. Don't you just hate those kind of dreams where your mind plays tricks on you? That dream definitely told me that I really want vintage Sanrio stuff. LOL! It seems I'm enabling my sanrio addiction one step further.